URL Mapping is a mechanism by which you can change the displayed url in address bar. Your asp.net application is developed from years, with convention frm as prefix to webform. Now to change already assigned name to legacy system which is maintained for past few years and to avoid risk we can make use of URL Mapping. Step1: Add Mapping URL in web.config file. Step3: Now Check your ugly looking URL, it is replaced with New desired URL. Lets understand Encrypt and Decrypt particular section in web.config file with example of connectionstring encrypt in web.config file. 1. Defining Path for Web.Config. 2. Opening Web Configuration File. 3. Getting Connection String Section for Encryption. 4. Protect Connection String Section. 5. Make Changes Saved to Configuration File. @ Colleague Thanks for providing useful information. 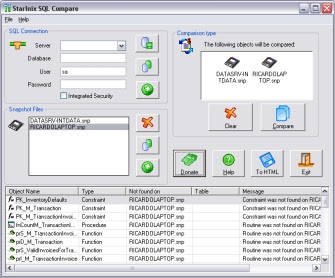 Free Database Compare Software for SQL Server , MY SQL and MS Access. It will also allow you to create snapshots of a database and compare a live database to a snapshot. A database structure viewer is included. You can filter the comparison results by type of object and you can also choose to exclude the comparison of constraints and fields.